Want an easy way to look stylish, but feel comfortable at the same time? 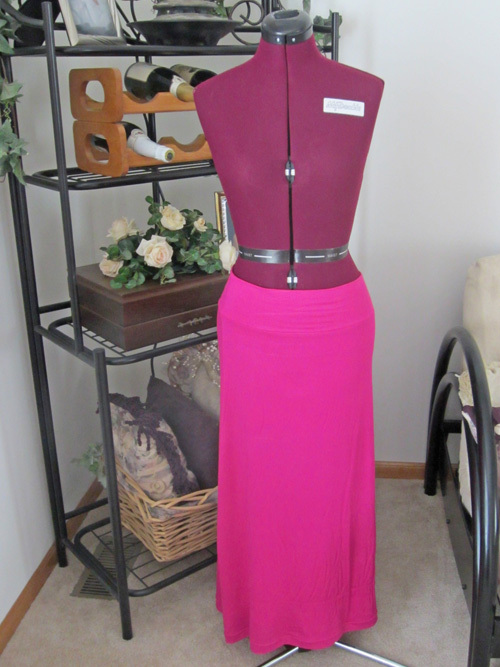 Sew up a customized maxi skirt – it’s easy to wear without sacrificing fashion! Step 1) Find your measurements. Tip: To guarantee the best results, it is important to take very accurate measurements. You may want to enlist the help of a friend and wear minimal clothing to achieve precise numbers. Place the tape measure around your body at the “waist” where you intend to wear your skirt. This can be your natural waistline (where your belly button is located) or lower (e.g. 1″ below belly button) depending on your comfort level. Plug that number into this formula: Waist measurement divided by 2, plus 1/2″ seam allowance = _____ inches = Skirt Measurement A. For example, if your waist measurement is 30″, divide 30″ by 2 to get 15″, then add 1/2″ to get 15-1/2″ for Skirt Measurement A. 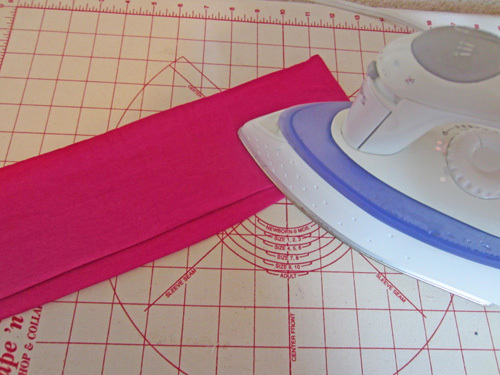 You will use measurement A when cutting out your skirt. 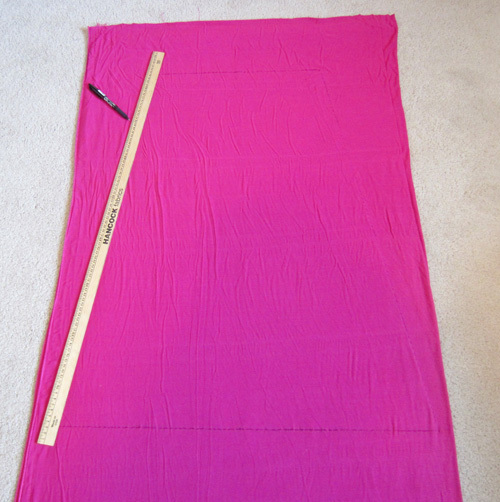 Measure the length you want your skirt to be. To take this measurement, start at where you intend the “waist” of your skirt to be and end where you would like the finished skirt to end (ankles, floor, etc.). Keep in mind the shoes you may be wearing, as this could change the look and length of your design. 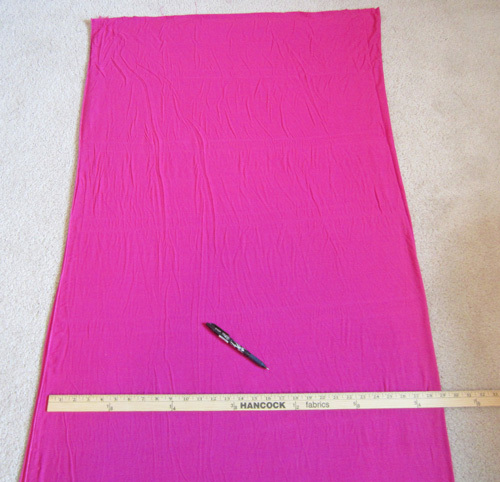 Plug that number into this formula: Length measurements minus 2-1/2″ = Skirt Measurement B. 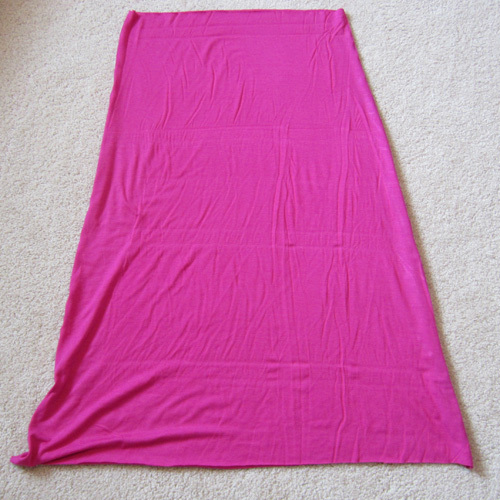 For example, if you want your skirt to be 35″ long, subtract 2-1/2″ from 35″ to get Skirt Measurement B = 32-1/2″. Step 2) Cut the waistband. 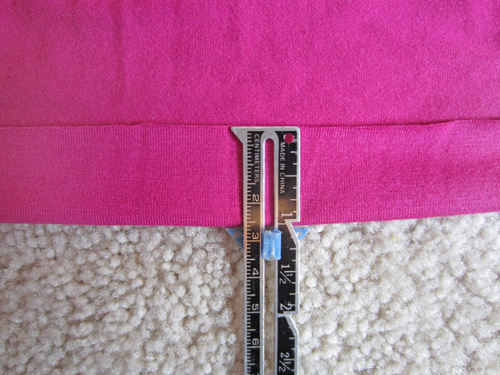 Cut two 7-1/2″-wide strips the length of Skirt Measurement A. For the example above, cut two 7-1/2″ x 15-1/2″ strips. Step 3) Cut the skirt. Fold the skirt fabric in half, making sure that the stretch is going from side to side (around your body) and not up and down. 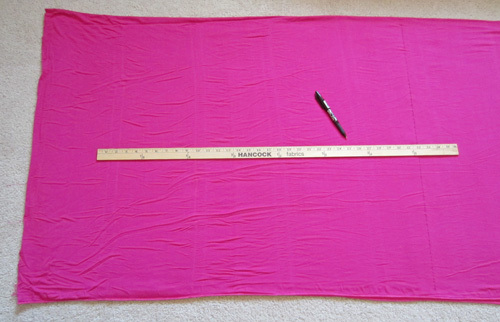 From this line measure up the length of Skirt Measurement B (for the example above, 32-1/2″) and make a mark. 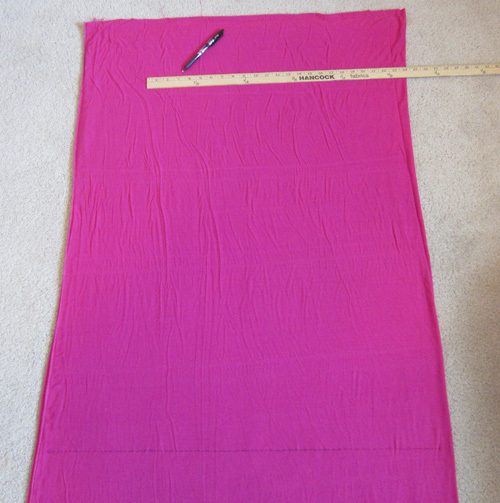 From here, draw the length of Skirt Measurement A across the fabric (for the example above, 15-1/2″), being sure this length is centered over the bottom line (for the example above there will be about 7″ from the ends of the line to the edges of the fabric). Connect the ends of the upper and lower lines to create a trapezoid shape. Cut along the drawn lines, taking care not to move the layers of fabric when cutting. Shifting layers will alter the size and shape of the trapezoid, affecting the finished garment. You now have two skirt panels. Step 4) Stitch the waistband. Note: All seam allowances are 1/4″ unless otherwise stated. 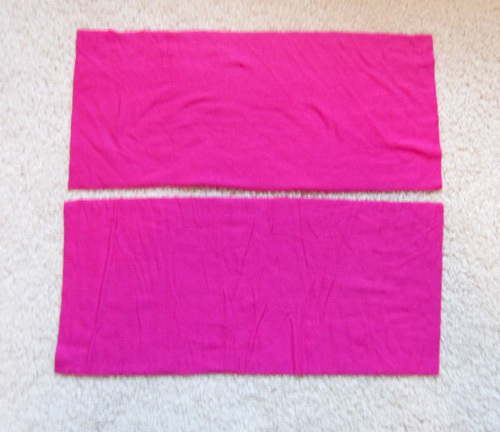 Sew the short ends of the two waistband pieces right sides together. 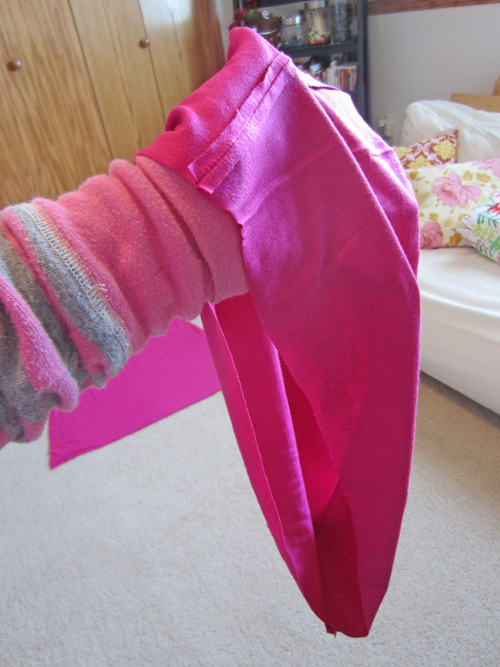 Fold the band in half lengthwise, wrong sides together, matching the raw edges and the seams. Press. If desired, baste the raw edges together. Set the waistband aside. 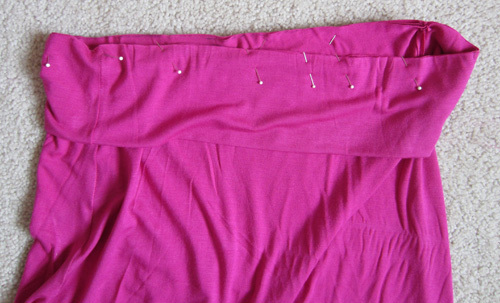 Step 5) Stitch the skirt. 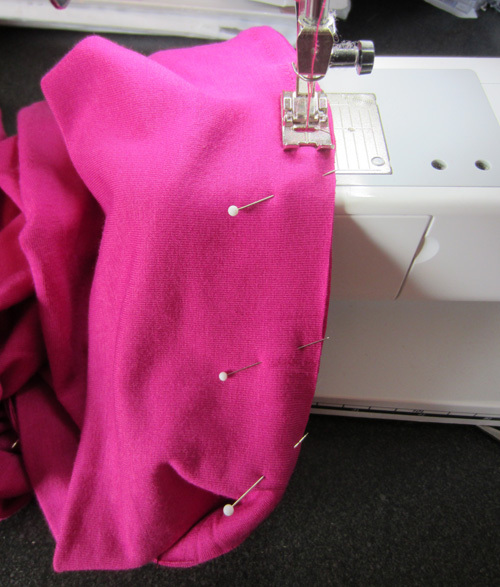 With right sides together, stitch the sides of the two skirt panels together using a narrow zigzag stitch. 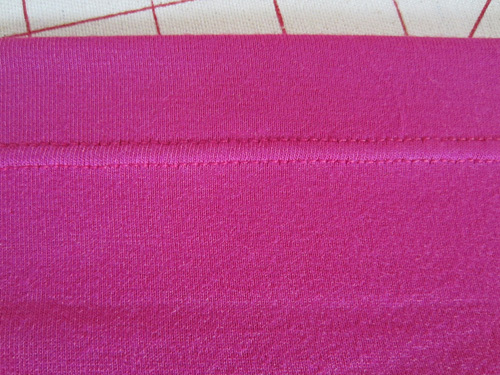 Place the waistband around the upper skirt edge, right sides together, matching raw edges and seams. Stitch using a narrow zigzag. Press seams toward skirt. 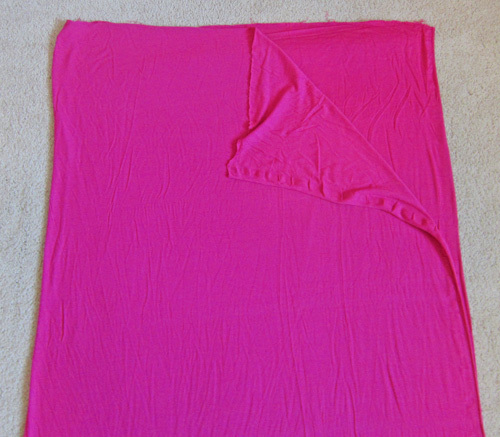 Fold under 1″ along the lower edge of the skirt. Press. Stitch close to the raw edge. 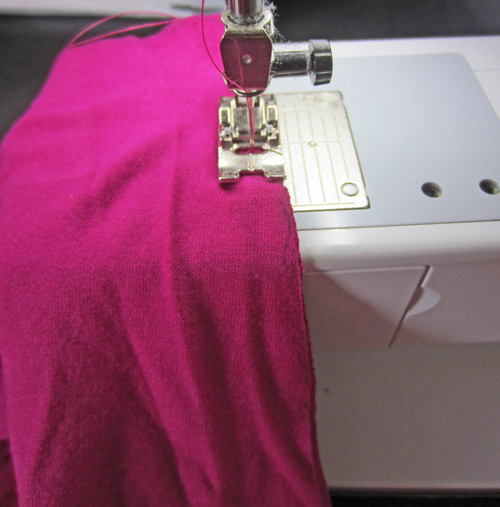 For a more ready-to-wear look, use a Twin needle to stitch the hem. I love this tutorial, and I think i’d like to try it. I’m wondering if you would recommend any changes for a wearer who has a significant difference between waist and hip measurements. 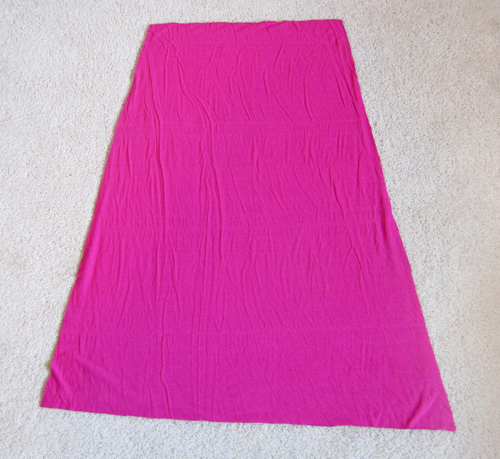 In general, I find these types of skirts to fit me loose in the waist and too tight across abdomen. Thanks! Thank you so much for the great idea and prompt reply! I appreciate it. 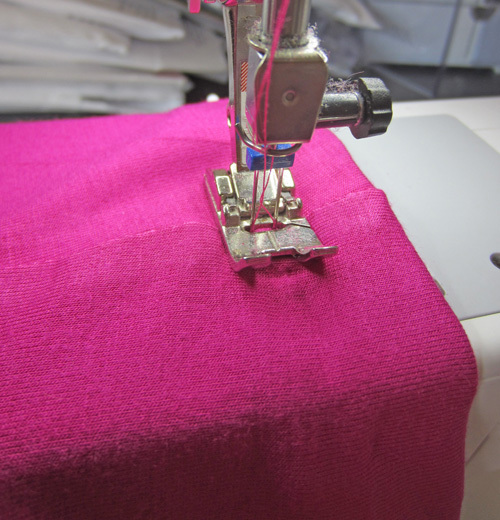 Try sewing some elastic thread with a decorative stitch in parallel pattern to the waist. It will be a “faux” smocking to take up the extra fabric while drawing attention to your waist. Also, you can use thread in the same color to make it more invisible. I have a similar problem…thunder thighs and breeder hips…..gene pool! ! ! Just registered, and having troubles bringing up the tutorial on the Maxi Skirt. I’ve tried clicking on the Trackbacks area, on the photo of the skirt, on the name of the designer and it brings up a blank new window and then nothing. Any suggestions? I think I will try this. This is done in knit fabrics? ?